As many as 40 million are said to have stayed home on Friday while thousands protested in the streets against government reforms. SÃO PAULO, BRAZIL – Major cities in Brazil came to a standstill on Friday as hundreds of people took to the streets to protest against government reforms while many others stayed home in what is being called the largest nationwide general strike in decades. Without public transportation Brazilians looked for alternate means to get to work. 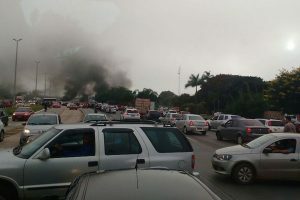 Protesters also blocked highways like this one in Brasilia, photo by Neide Maria/Agência Brasil. In many cities public transportation workers, teachers and industry workers stayed home. Entire public school systems were closed and in the country’s largest city, São Paulo, those who attempted to go to work looked for alternative means of transportation, due to the lack of buses, metro and train services. The nationwide strike was called by Brazil’s largest workers’ unions, which claim that the social security and labor reforms, currently being discussed in Congress, will lead to a loss of workers’ rights. According to organizers more than 40 million workers adhered to the strike on Friday. In addition to the millions who stayed home, thousands took to the streets to protest against the reforms. According to union leaders more than 1.5 million demonstrators gathered in protests. Numbers released by police officials put the number of demonstrators at 97,000. 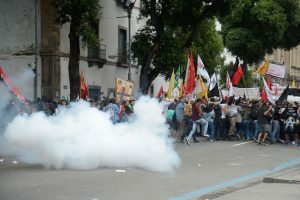 The two largest union federations, CUT and Força Sindical, considered the strike a success. Congressional Representative Paulo Pereira da Silva, President of Força Sindical said that workers decided to strike because there are viable proposals for the country to resume economic growth without the loss of any labor, social security and social rights’. The federal government however, downplayed the strike, with officials stating that the demonstrations were restricted to the large centers. According to officials the low number of protesters on Friday indicates that the majority of the population supports the reforms proposed by the Temer Administration. Police and protesters clash in the streets of Rio de Janeiro on Friday, photo by Tomaz Silva/Agência Brasil. “We expected very significant demonstrations, and those did not occur,” said Minister of Justice Osmar Serraglio on Friday night to reporters. For the Minister the small groups demonstrating shows that the population as a whole supports the government’s proposed reforms. “There is no way to think of the solution to the country without the reforms. Responsible people know that [reforms] are necessary,” concluded the official. Although in most cities the demonstrations ended peacefully, violence erupted at the end of the protests in Rio de Janeiro and São Paulo, with clashes between protesters and police. In Rio de Janeiro, protesters torched nine buses, while in São Paulo the neighborhood where President Temer has his private residence turned into a battlefield with police firing tear gas into a crowd of protesters. There were no official accounts of deaths during Friday’s confrontation, although local media did report some protesters suffered serious injuries in clashes with police.